Who is Yeah Samaké, and what does he want? From my lonely log cabin high atop Bamako’s Colline du Savoir, I’ve noticed a growing amount of media attention in recent months around a 43-year-old Malian man named Yeah Samaké. He’s the youngest contender for Mali’s presidency, and has been featured on PRI’s “The World” in January, and again in a February article in Slate Magazine. Both sources mention his status as a “frontrunner” in this country’s presidential elections, scheduled for next month. Niankoro Yeah Samaké hails from Ouélessébougou, a small town 80 km south of Bamako. According to his Wikipedia entry and his campaign website, he grew up poor in a large family, attended secondary and post-secondary schools in Bamako, then in 2000 he moved to Salt Lake City where he earned a masters degree in public policy from Brigham Young University. 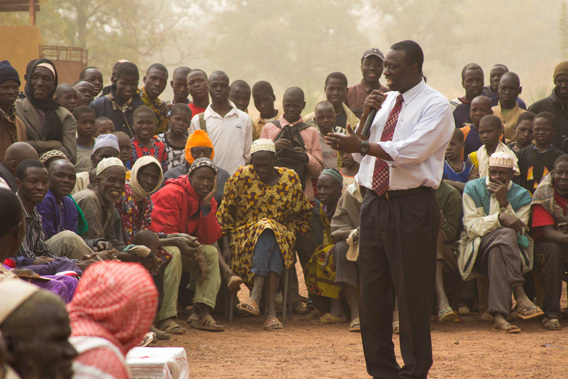 After graduation Samaké became executive director of the Mali Rising Foundation, an organization established by prominent Utah community and business leaders in 2004; the foundation’s mission includes school construction and teacher training, and it has so far built 12 schools in five southern Malian communities, including Samaké’s hometown of Ouélessébougou. Last spring he declared that he would contest presidential elections to be held in April 2012. I have heard plenty of good things about Yeah Samaké, and I have no doubt that he could make Mali a better place. But I also have serious reservations about his candidacy, which I will group into the following five areas. Malian grassroots vs. U.S. AstroTurf: Samaké’s campaign has made a point of not fundraising in Mali, ostensibly to avoid corrupting influences. Instead he is targeting donors in the U.S., not just Malians living there but Americans as well. (To get a sense of how thoroughly American-oriented his efforts are, consider that his campaign website is entirely in English, and includes an “About Mali” section.) By the Number One Law of the Universe — “There is No Such Thing as a Free Lunch” — his presidency would be beholden to foreign interests. The idea that any presidential candidate can raise all necessary funding outside the country he/she expects to serve raises all sorts of ethical concerns. Media buzz (and the lack of it): In contrast to many of the other men who’ve announced their intention to run for Mali’s presidency, Samaké has generated relatively little coverage in the Malian press. A search on Maliweb, a site that posts articles from Malian newspapers, reveals just 19 mentions of the name “Yeah Samaké” since January 1st of this year. 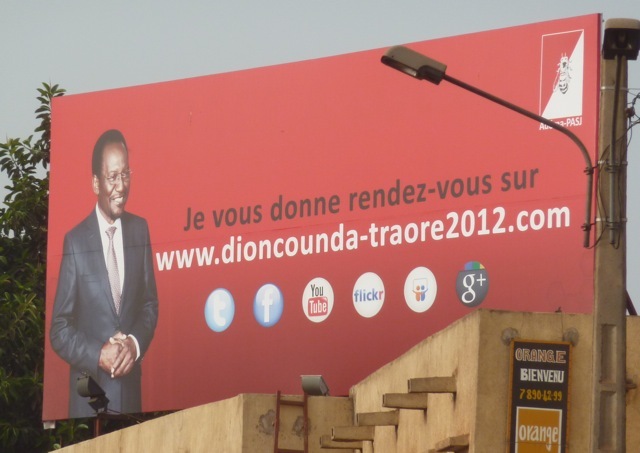 By comparison, during the same period there were 128 mentions of “Soumaila Cissé” (former prime minister and presidential candidate), 131 mentions of “IBK” (for Ibrahim Boubacar Keita, former prime minister and presidential candidate), and 196 mentions of “Dioncounda Traoré” (President of Mali’s National Assembly and presidential candidate). Tellingly, in addition to the PRI and Slate stories mentioned above, much of the media coverage of Samaké’s campaign has come from U.S.-based outlets like the Deseret News, Meridian Magazine, and the Daily Herald. Name recognition (and the lack of it): As a consequence of his low media profile, coupled with his relative lack of experience on the national political stage, coupled with little traditional advertising (I have yet to see him on a billboard, unlike many of his rivals), Yeah Samaké is not exactly a household name, at least in Bamako. Most cab drivers I ask either haven’t heard of him or don’t know who he is and what he’s achieved. Last Friday, before beginning a lecture to my class of over 200 fourth-year sociology students at Bamako’s University of Letters and Human Sciences, I did an experiment, asking the class to free-list their country’s declared presidential candidates. Students volunteered the names of 19 other candidates before someone finally mentioned Samaké’s name several minutes into the exercise. Only two more names came up after his, exhausting the field. But maybe fourth-year sociology students in Bamako just aren’t Samaké’s demographic. “Marché nyini”: How can Samaké justify his claims to frontrunner status? With no opinion polls here, it’s impossible to know who’s in the lead. But given his lack of media coverage and name recognition, given the fact that his political experience is limited to three years as mayor of a provincial town, given the fact that he is up against major political figures (including at least five ex-prime ministers) backed by major national parties, let’s call Samaké’s presidential bid what it is: a long-shot. I will be very surprised if he garners more than 5 percent of the vote come April 29th. Does he truly think he can win? Or is he just engaging in what Bamakois call marché nyini, literally “looking for a market” — i.e., some kind of personal benefit? In other words, is he being sincere when he represents himself to U.S. donors as a leading candidate, or is he trying to pull the wool over their eyes? These questions may seem cynical, but politics in this part of the world is an unrelentingly cynical business. Finally, The Mormon thing: He doesn’t exactly broadcast the fact over here, but Yeah Samaké is a convert to Mormonism. (Literally nobody I’ve asked in Bamako who’d heard of him has been aware of this fact.) In his PRI interview he claims that his faith in no way prejudices his countrymen against him. There was a time, 10 or 15 years ago, when I would have believed that it wouldn’t make any difference for his political prospects in Mali, where people have long espoused a tolerant and a-political approach to Islam. Alas, in recent years the social and political landscape has shifted: in 2009, for example, Bamako-based Islamic “civil society” groups organized massive protests against a bill that would have reformed women’s rights, claiming it was contrary to Islamic law; the demonstrations ultimately forced the Malian government to scuttle the reforms. If, by some miracle, Yeah Samaké does manage to make it into the second round of this year’s presidential election, it’s hard to believe the same forces — well organized, well funded and increasingly vocal in opposition to what they portray as foreign, anti-Islamic influences — wouldn’t unite around his opponent and crush Samaké’s Mormon/American-financed candidacy by whatever means necessary. If his faith hasn’t been an issue for him in politics so far, it may simply be because he hasn’t been taken seriously as a candidate for national office. Whatever happens in the election, one thing is sure. It will take a lot more than one man — however dedicated and talented he may be — to change Mali’s political culture and root out the venality, waste and cynicism that characterize it. But just maybe Yeah Samaké’s run — if it’s genuine, and even moderately successful — will inspire other reformers to get into the game, and prove to be a harbinger of a more hopeful future. Postscript (March 21, 2012): An article about the upcoming election on The Africa Report lists four candidates who “stand a real chance of being sworn in,” and Samaké isn’t among them. Postscript 2 (May 2, 2013): Time correspondent Aryn Baker has written a new profile of Samaké and his continuing bid for the presidency. This entry was posted in Uncategorized and tagged elections, mali, Yeah Samaké. Bookmark the permalink. 8 Responses to Who is Yeah Samaké, and what does he want? Thanks for doing this blog post – really informative and something I have been wanting to learn more about! Yes, a fairly good story but I am confident Yeah will succeed. If not in this election then another. I personally know Yeah and he WILL make a difference for the suffering people in Mali. Perhaps you can find a way to help him gain media coverage in Mali. Perhaps do another experiment in your class and get class members to promote a candidate of their choice and insist that Yeah be amont them – and all other candidates. If you want a fair and just President, if you want the people of Mali to have freedom and education, you need to vote for Yeah – you need to promote Yeah. Let’s see you put your money where your mouth is and do something positive to promote Mali and the wonderful opportunities that should be available – absent a corrupt government! I’m not in the business of promoting any candidate for office in Mali (are you? shouldn’t it be their business, not yours? ), and in any case (apparently you missed it) there’s been a military coup in this country and nobody knows when elections will be held. Interesting! Did Samaké also describe himself as a frontrunner with you? It’s this aspect of his campaign that bothers me most: he is guilty either of unreasonable optimism, or of willfully misleading a lot of people in the USA, I suspect in order to attract donations. To some degree it comes with the territory – any candidate for elected office has to convince people he/she at least has a chance of winning, otherwise nobody will donate to the campaign. But in this case, where the donors would have a hard time verifying the candidate’s claims, it’s especially problematic. Now that the coup has happened, of course, all bets are off, but it certainly doesn’t improve his odds of becoming president. Yes, he did present himself as a frontrunner. He held a fundraising rally at Utah Valley University and brought several other Malian men who he said were mayors of other cities who support him and are members of the political party he formed. Some people were very enthusiastic, but I have a friend who does a lot of work in Africa and he thought the idea of him fundraising here and bringing mayors was odd. Regarding your first point, I think Samake is just exercising one of his main networks to fundraise. With so many presidential candidates, he has to rely on his primary social networks- and in this case he has a very strong network in parts of Utah, where he lived for a while- sure, he could go around his home municipality and raise money, but probably wouldn’t get as much bang for his buck- and while you make a valid point about “western interests,” to be fair, I think many donors in the U.S. are just generally interested in seeing him succeed, given his track record in his home municipality (i.e. here is someone who actually practices what he preaches)- I don’t even know what possible hidden agenda a bunch of rich Mormon donors in Utah could have with a Malian presidential candidate, except for maybe hoping he would allow greater access to the LDS Church’s humanitarian efforts and allow foreign LDS missionaries to share their faith with non-Muslims in Mali (spoken as a former LDS missionary in a majority-Muslim country). But since he’s LDS, he would probably take those positions anyway. I’m not saying it’s not an issue, my sense is that it is not as big an issue as one might think. And he’s obviously not going to say, “well, it’s a real long-shot…Donate today!” I doubt if you asked any of the candidates if they thought they were a front-runner that they would say, “nah.” As you state, with no real polling data it’s hard to know, but he DID win by a landslide the last time he ran for office, I could see that as a factor in his self-confidence going forward. However, it’s likely, given your on-the-ground data (not to mention the coup), that Samake is not likely to win…it may take some more time to address those points you raise in this post. Thank you for the insightful reporting on Mali.